Under the watchful eye of Father Silvano Bentivoglio and Dr. Vittoria Vetra (Ayelet Zurer), the CERN scientists start the Large Hadron Collider and manage to capture three vials of antimatter. Immediately afterward, someone kills Father Silvano, and uses his retina to break into the containment room to steal one vial of anti-matter. In Rome, the Vatican mourns the passing of the Pope. The Vatican staff prepares for the Conclave of the College of Cardinals, which will select the next Pope. Until the Conclave selects a new Pope, the Camerlengo (Ewan McGregor) assumes day-to-day control of the Vatican. Reporters, nuns, priests and other faithful all crowd into St. Peter's Square, waiting for the white smoke from the Conclave. But the Illuminati, a 400-year old, underground secret society, kidnaps the four most likely candidates (preferratti) before the Conclave goes into seclusion. The Illuminati threatens to kill them at 8, 9, 10 and 11 PM, and then destroy the Vatican in a burst of light at midnight. A video feed shows the missing anti-matter vial, which will destroy the Vatican and parts of nearby Rome when the magnetic containment field fails. The Vatican summons Drs. 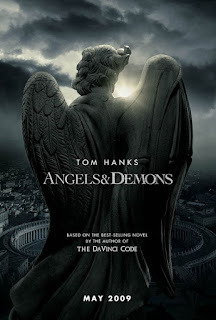 Robert Langdon (Tom Hanks) and Vittoria Vetra from CERN to help them solve the Illuminati's threat, save the four preferratti, and replace the vial vial's batteries. Langdon listens to the Illuminati message and deduces that the four cardinals will die at the four alters of the Path of Illumination. However, no one knows where these alters are located. Vetra demands the Swiss Guard fly Father Silvano's diaries from Switzerland. They hope he wrote down the name of whomever he discussed the CERN experiment. Langdon demands access to the Vatican Library (something he has requested 10 times already) to see the original copy of Galileo's banned book. Using the clue from this book, Langdon, Vetra, and Lieutenant Valenti (Victor Alfieri) of the Vatican police race to the first church, only to find the body of the first Cardinal, branded with the word, Earth (in English!). They find the direction of the church with the seond Illuminati alter, but arrive in time to see the next Cardinal die, branded with the word Air. Langdon locates the third church with the third Illuminati altar, but tries to save the third Cardinal from burning to death, while the assassin kills the Vatican policemen. He convinces the Rome police to race to the last church of the Water alter, and manages to save the last Cardinal. However, location of the last Illuminati altar remains in question. When Langdon discovers evidence of the resurgence of an ancient secret scientific society known as the Illuminati - the most powerful underground organization in history - he also faces a deadly threat to the existence of the secret organization's most despised enemy: the Catholic Church. When Langdon learns that the clock is ticking on an unstoppable Illuminati time bomb, he jets to Rome, where he joins forces with Vittoria Vetra, a beautiful and enigmatic Italian scientist. Embarking on a nonstop, action-packed hunt through sealed crypts, dangerous catacombs, deserted cathedrals, and even to the heart of the most secretive vault on earth, Langdon and Vetra will follow a 400-year-old trail of ancient symbols that mark the Vatican's only hope for survival.